This is a beautiful Catalan country house restored as a rural tourism hotel in Girona. The house has been totally remodeled to offer you 10 charming comfortable rooms, totally equipped. Depending on the double room, suite or suite with swimming-pool you want for your stay, you can choose private heated swimming-pool in the bedroom, jacuzzi, bath or whirlpool bath. We offer you 600m2 for you to enjoy your stay in Mas La Casassa. We have Wi-Fi and Internet connection in the reading and relaxation room and also in all the bedrooms. You can also have a nice time in the 14x6 outdoor swimming-pool, with inner jacuzzi of 3x3 meters. We are located in the first village of La Vall de Llémena, Sant Gregori, in Veïnat de les Cases Noves. We are sorrounded by bucolic landscapes of artistic inspiration waiting for you to discover if you stay in Mas La Casassa. We have excellent weather, good food and wonderful landscapes. We are 25 minutes from the magnificent beaches of Costa Brava, 90 minutes from the ski resort of Vallter in the Pyrenees in Girona and 1 hour from Barcelona. Just five minutes from the heart of Girona, you can enjoy relaxing green areas. There are pathways through the calm pastures and fields where you can walk, ride a bike or a horse. We can find a rich cultural heritage of hermitages, castles, medieval houses, mills, fountains and lots of other sites. Sant Grau's peak is the highest spot in the town, and the river Llémena passes through Sant Gregori and Vall de Llémena. Sant Gregori is 112 meters above the sea level. Sant Gregori borders Salt and Bescanó on the South, Sarrià de Ter, Girona and Sant Julià de Ramis on the East, Canet d'Adri and Palol de Revardit on the North, and Sant Martí de Llémena and Sant Julià del Llor i Bonmatí on the West. Sant Gregori includes the villages of Cartellà, Sant Medir, Taialà, Ginestar, Constantins and Domeny. The abundant water provides several fountains, some of which located in wild remote sites are the target of excursions around Mas La Casassa. The variety of lanscapes in Sant Gregori makes this territory an ideal place for family activities. Cycling, hiking or horse-riding are the most regular sports practised in the old paths. There are also two BTT routes in Canet d'Adri and Sant Grau, and the Vall de Llémena cycle path from Sant Gregori to Girona. You can also go canoeing in the river Ter, which is next to the greenway from Girona to Olot. You can also do sports such as geocaching, orienteering, archery and kayaking. There are golf courses and paddle courts near the house. You can enjoy a food tour: El Celler de Can Roca with three Michelin stars, La Garrotxa-Volcanic cuisine with the restaurant Les Cols as the maximum exponent, market cuisine such as El Maràngels, el Racó de Can Pep, Can Toscà, Can Joan d’Adri, Can Xifra or El Celler de l’Adroher. If what you want is to go shopping or visit museums, we are 5 minutes from the commercial centre of Girona, the old quarter of Girona, the Museum of Cinema Tomàs Mallol, the Museum of Jewish History, the Museum Treasure of the Cathedral or the Casa Masó. You can visit the Cathedral of Girona, the Basilica of Sant Feliu, the Arab Baths, the ancient Jewish Quarter, the monastery of Sant Pere de Galligans, the monastery of Sant Daniel, the Wall of Girona or the houses of the Onyar river. The Dalí Museum is in Figueres, only 25 minutes away. 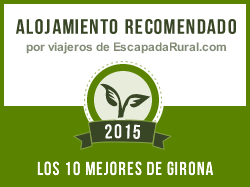 We hope you enjoy with us your visit to Girona or your holidays in Costa Brava. We are waiting for you!